This beautifully designed barn style shed proudly shows off a classic look that you might find along the countryside, only this shed can be installed in your backyard. 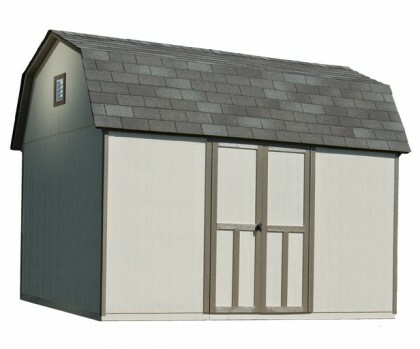 This large shed features 835 cubic feet of storage space and 6'4" tall side walls, storing long handled tools, lawnmowers, small tractors, wheelbarrows, trimmers and collectibles is easy. Outfitted on a robust 2x4 wood frame, the exterior siding is specially engineered by Louisiana Pacific to be rot and fungal decay resistant. This barn shed is hand-crafted with the finest lumber - obtained from sustainable well-managed forests. If you’re looking for a spacious, stylish and easy to customize storage solution, this 12'x8' shed is the right choice. One of the benefits of a gambrel roof style building is it features nearly 30% more overhead storage space than a gable roof. That presents the perfect opportunity for customization to make your shed naturally expand as your family grows. Adding a shelf and workbench would be a great start to turning your barn shed into a large workshop, home studio, hobby room or personal sanctuary. Be sure to check out our premium selection of accessories to learn more. Your local building authority may have specific requirements resulting in additional cost. Prices do not include painting, staining, permits, zoning and setback advice and/or compliance, excavation, or leveling beyond 6". All prices and content are subject to change without notice. Promotions are valid with online transactions only and cannot be used in conjunction with promotions at a servicing sales/distribution center or distribution center. Not valid on prior purchases. All stated sizes are nominal dimensions and approximate. Some buildings may be shown with optional items. Additional mileage charges (if applicable) and taxes will be calculated after checkout process is completed. Painted 12 x 8 barn shed is a representation only, arrives primed for painting in a light beige color. I ordered the 12' x 8' Gambrel shed for my Dad from the Shed Liquidators in Livonia, Michigan. The person who installed it did a great job. Due to impending rain he had to leave and then return two days later (as he had a shed to install elsewhere the next day). He answered all our questions, would explain at what point in the install he was and what he'd be doing next, would give us an approximate time as to when he'd move on to the next part of the shed install, and gave my Dad and I a heads up on trim pieces we could paint with primer while he was working so it would save us time later when painting the shed. One of the door trim pieces was missing from the kit, but that wasn't an issue as we like the door with the trim that was installed (before finding out that the one piece was missing). His boss happened to be in the area (on a Sunday! ), checked how the install was coming along (our installer was just finishing up), asked if we were happy with the shed (we are! ), and I have to say we were impressed with our installer (who was on time both days), his boss, and our new shed. I also want to add that I read the reviews and called the Livonia location to ask questions prior to the install. The manager I spoke with answered all my questions and alleviated any concerns I had. My only complaint...is I wish Shed Liquidators also built ramps for sheds. I'll be helping Dad build the ramp...but I'd have happily paid additional as part of the install process if this could have been done for us. Thanks to the Livonia, Michigan Shed Liquidators and our installer for a great shed and overall wonderful install experience! Learn about our barn shed installation process here. 3' of clearance around your entire large shed is required. 4' if larger than 160 sq. ft.